Renowned singer-songwriter Lloyd Wood joins us at 7 p.m., April 26, at the Shawnee Theatre. 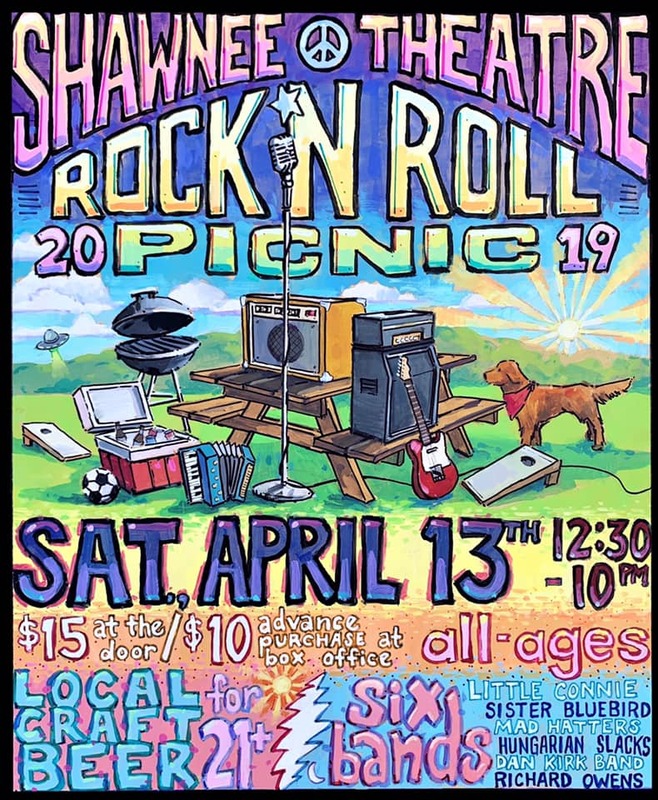 Join us for the 2019 Shawnee Rock n' Roll Picnic with local craft beer, live music and great food. Bands playing include Little Connie, Sister Bluebird, Mad Hatters, Hungarian Slacks, Dan Kirk Band and Richard Owens. Tickets are on sale now for this all-ages event — $10 ahead of the picnic or $15 at the door. While the 2019 season is months away, the Shawnee Theatre staff has been hard at work planning and prepping for next season. “It’s going to be our biggest, most ambitious season yet,” Bri Lindsey, producing artistic director, said. With just five days until Christmas, Flex Passes make perfect stocking stuffers can be yours for just $60. We are excited and honored to announce we have received a $7,500 matching grant from the Greene County Foundation to go toward our matching seat fund. Double your impact today: shawneetheatre.org/donate. You’re invited to our annual Beer, Wine, Cheese and Chocolate Event on Friday, Nov. 16 from 6-9 p.m. at the Shawnee Theatre. 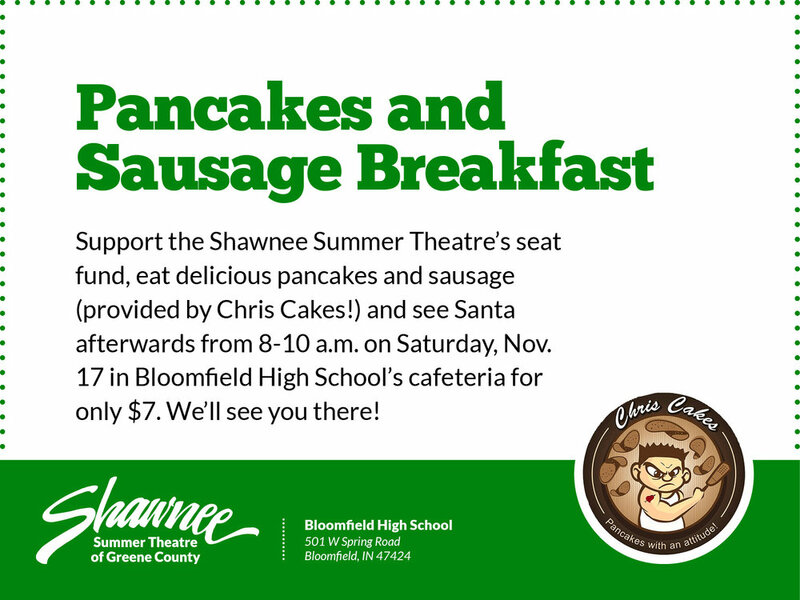 Come eat Chris Cakes’s delicious pancakes and sausage at our Breakfast with Santa on Saturday, Nov. 17. The cost is only $7 (however, donations are always accepted!) and proceeds go toward our seat fund! 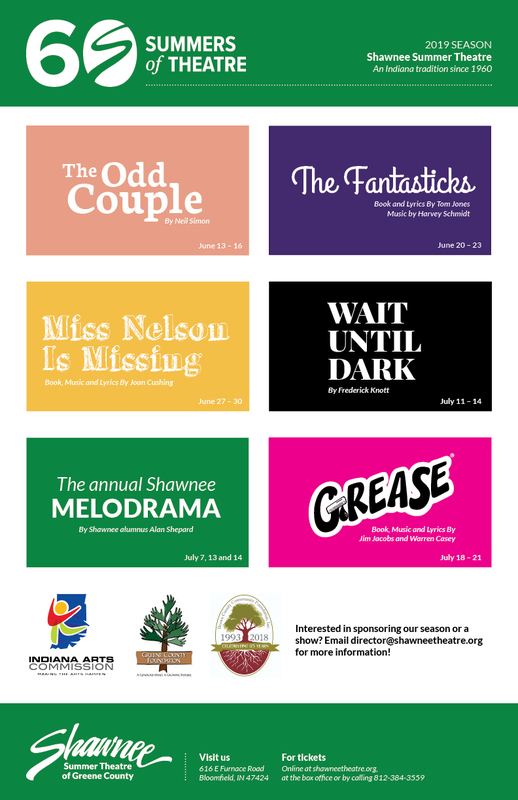 A new Neverland tale is coming to the Shawnee Summer Theatre as the new play If You See Me Forgetting You opens June 28. Wendy (Kate Braun) is missing, and the only clue her grandchildren have is a note mentioning Neverland. When Wendy is locked away on the Jolly Roger, Amos (Jackson Janowicz) and Maggie (Amanda Rooksbury) — her grandchildren — must lead an unruly band of Lost Boys, battle pirates and they even encounter a Peter Pan (Darl Horning) who wants to trade places with Captain Hook (Adam Lewis). Along the way, they learn there is no better map than the human heart and no better story than the one you're currently living. Bring your children and your imaginations and leave with a night of theatre you'll never forget. If You See Me Forgetting You is another exciting chapter in the timeless adventures of Peter Pan in Neverland. “If you don't leave the theatre wondering if there's still some fairy dust in a pocket somewhere, or an old sword in the closet, then we haven't done our job,” he said. On the heels of a successful 59th opening weekend, the comedy-drama Steel Magnolias coming next weekend, June 21 to 24. The action is set in Truvy's (Andrea Swift-Hanlon) beauty salon in Chinquapin, Louisiana, where all the ladies who are anybody come to have their hair done. Helped by her eager new assistant, Annelle (Madison Mattfield), the outspoken, wise-cracking Truvy dispenses shampoos and free advice to the town's rich curmudgeon, Ouiser (Kate Braun). Meanwhile an eccentric millionaire, Miss Clairee (Courtney Slough), who has a raging sweet tooth; and the local social leader, M'Lynn (Bri Lindsey), whose daughter, Shelby (Kristen Phaneuf), is about to marry a "good ole boy." Filled with hilarious repartee and not a few acerbic but humorously revealing verbal collisions, the play moves toward tragedy when, in the second act, the spunky Shelby risks pregnancy and forfeits her life. The sudden realization of their mortality affects the others, but also draws on the underlying strength — and love — which give the play, and its characters, the special quality to make them truly touching, funny and marvelously amiable company in good times and bad. The musical Always...Patsy Cline will open the 59th Shawnee Summer Theatre season June 14, with music performed by The Flyovers, a Greene County band. The two actress show follows the improbable, yet real-life, friendship between Patsy Cline (Holli Burnfield) and Houston housewife Louise Seger (Bri Lindsey). Their friendship started by sheer coincidence and lasted until Cline’s untimely death. The show opens the theatre’s 59th consecutive season, which makes it the state’s oldest continuously-running summer stock theatre. The show opens 7 p.m. on Thursday, June 14 with shows Friday (6/15) and Saturday (6/16) nights, before ending with a 2 p.m. Sunday (6/17) show. Ivy Tech Student Productions will present "Anon(ymous" at the Shawnee Theatre at the end of April.